Did you know that English is supremely well-suited to puzzle writing? Some languages just don't have many word puzzles like crosswords (such as many Asian languages). English is so good for word play, puns, and puzzles because it has huge redundancy — there are generally lots of different ways of expressing the same general idea. For example, if you want to say you're happy, you could also say you're : cheerful, delighted, carefree, cheery, merry, joyful, jovial, jolly, gleeful, smiling, lighthearted, pleased, contented, gratified, bouyant, radiant, sunny, blithe, sunny, joyous, chirpy, elated, over the moon, tickled pink, on a high, happy as a clam, or even jocund, and that is only half of the synonyms for happy! You never need be lost for words! The full English vocabulary is also massive. It is probable that English has more words in it than any other language (see what the Oxford Dictionary bods have to say on this subject), although this is almost impossible to pin down definitively. This massive vocabulary, with words assimilated into the language from a vast array of languages from Latin, French, and Hindi, to African and Germanic languages also means that there is great variety in the spelling of words — letter patterns differ widely, such as the endings of words, prefixes, suffixes, diphthongs (combinations of two vowels, such as au, ou, oo, ae, etc) and so on. Here's an example of what I mean— ARMADILLO, TABOO, BUREAU, PYJAMAS, MOCCASIN, OBELISK, and ANGST are all 'English' words that we understand, but actually come from Spanish, Tongan, French, Persian, Native American, Egyptian, and German respectively (these sorts of words are often called loanwords). Look at the different letter patterns ending the words, -ILLO, -BOO, -EAU, -MAS, -SIN, -ISK, -GST ... great variety! Not like in some languages where there are commonly used word endings (such as in Japanese where words always end with a vowel). And I'll only barely mention the tricky things like homophones (words that sound the same but mean different things), like male and mail, which make puns and cryptic crosswords possible! This stunning variety in English spelling means that there are a great many possibilities with fitting words into grids, whether crosswords or word searches. It's essential to have this sort of redundancy ("the use of words or data that could be omitted without loss of meaning or function") when writing puzzles, otherwise you don't have enough words to choose from to make the grids work. 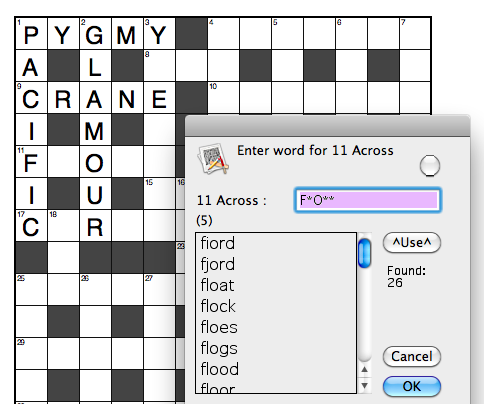 Have a look at this screen shot from my custom crossword software (created by my wonderful husband). I have a letter pattern of F _ O _ _ to fill, and there are 26 words that fit that pattern (from my dictionary list, anyway). So I put in FLOCK, but then the crossing over word at 3 Down becomes the pattern Y _ E _ K _ _ (see the grid) and there are no words that fit that pattern. 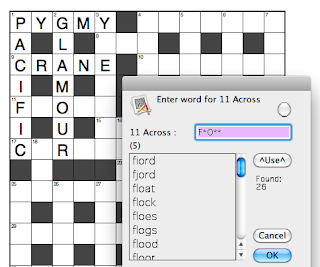 I can go back, and select a different word for that F _ O _ _ position, that doesn't end in K. So as you can see, this redundancy — the plethora of choices for most of the word positions in a word search or crossword — is a basic feature of English that makes it perfect for writing puzzles. Which is why English is so cool! I would guess that the great variety and level of redundancies in English would make it harder for translators working from English to other languages, if they're translating fiction and trying to get the right "feel" from the words. Yes, he's amazing ... he programs supercomputers for work though (astrophysicist) and has been programming in a multitude of languages since he was a lad. He's currently updating my software, too, yay! So it will be even better soon(ish). Moreover, we cut and chop and append new meanings to existing words, I "Nuke" my tea in the microwave. We create new words from acronyms. I don't scuba dive, I snorkel. Commercial names become generic terms. Do you have a kleenex? And on the unwritten edges of dialect, new words are spawned and grow. Don't dis slang as a word source. I DO love my native tongue! I love our language, I love the shows about it, the books about it, I can't get enough!! We are so lucky to have such a flexible and alive language. Wow, he wrote your programme???!! !